Binary options trading success is based on making the right calls on price direction. If a trader can correctly predict where price will go, then it is very likely he will make a trade that will be in the money. One of the ways this can be achieved is by being able to predict price breakouts. This leads us to ask the question: what really is price action, and what determines the behaviour of price action at any given point in time? The concept of price action is simply a depiction of the activity of traders in a particular market. Traders are in the market to make money. If they see something that will present itself as a market opportunity, they will put their money in the market to make the trade. At this time, we will see prices moving in one direction or in the opposite direction. If traders see nothing to convince them of an opportunity, they will sit on the fence and do nothing. 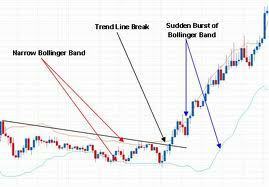 At this time, the price action will hardly go anywhere except just trend sideways. Fortunately, the binary options market helps us to trade the price action, whatever that may be. Unlike in forex trading or other markets where you need the market to be in motion to make money, you can actually make money in the binary options market even if the prices of the underlying asset stay still. In today’s lesson, we will explain a scenario that occurs when the market is in motion; the breakout. Breakouts occur after periods of price inactivity. They occur when traders get a hint of an impending market event that will affect the value of an underlying asset, so they take position in order to make money from such movements. One way of determining this is to look at the behaviour of the price action at the key levels of support and resistance. Before we get an upward break, prices may have tested the resistance level multiple times, with the points of retracement getting progressively higher. This indicates buying pressure. When we see this, this is a signal that prices will breakout upwards. The reverse is also the case for downward breakouts. Support levels will be tested repeatedly with points of retracement getting progressively lower, signifying selling pressure. 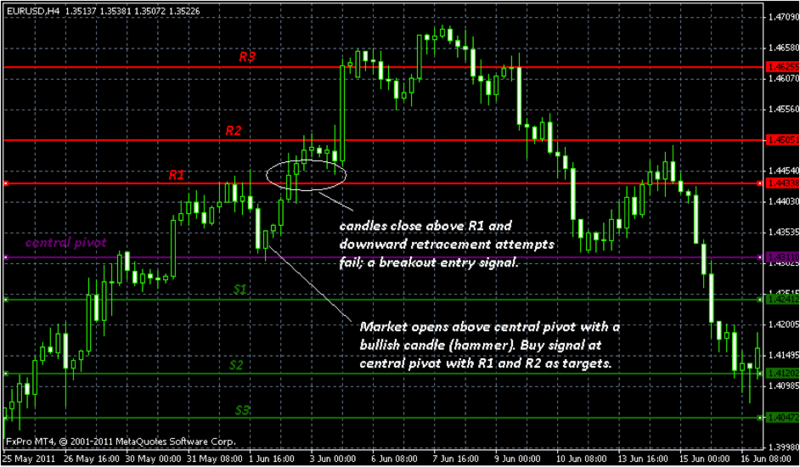 The pivot points show the support and resistance levels. We can see that R1 has been tested several times, and prices do not get back to where they started for the day at S1 before going back up. This indicates buying pressure which eventually breached R1. Price then tested R2 several times, but retracements never get back to the central pivot (marked purple) which was the previous retracement point. This shows increased buying pressure and we see this manifest as a bullish candle that eventually breached R2 all the way to R3. If I was to trade this on the binary options market, I will do this in three ways. I would trade the In/Out binary options trade, betting that the trade would end outside the S1 – R1 range, with a one week expiry. I would also trade the Rise/Fall variety, betting that the price of the EUR/USD will rise above the R1 point, setting a 72-hour expiry. I would trade the Touch/No Touch trade, betting that prices would touch a point somewhere between R1 and R2, for a one week expiry. The lesson here is that pivot points are an indispensable tool for binary options trading and if you can use them to watch price action at key levels of support and resistance, you will make good trade calls most of the time.